Suzanne Libfraind is the exclusive personal shopper for SouthPark Mall. Suzanne Libfraind is a high energy road warrior who travels back and forth weekly between her home in Raleigh and her job in Charlotte as the exclusive personal shopper for SouthPark Mall. She's one of the mall's best-kept secrets. Many people don't realize that she's available on an appointment-only basis to shop the mall for them in search of pieces that will work best with their body type and lifestyle. (The first session for new clients is complimentary; after that there is a fee). In Raleigh, she's president of Wardrobe Consulting, a business which offers a range of services including closet consultations, styling and image consultations for both individuals and corporations. Suzanne's motivtation for her busy career is simple: "What I do is so important to my clients and it's important to me," she says. She compares her passion for the business to being Charlie in the classic film Willy Wonka when he realizes he's won a rare Golden Ticket that allows him to visit the candy factory. "I have been given the Golden Ticket," she says. "I have been blessed to find a career that utilizes my skill set, my personality, my disposition, my thoughts and beliefs." Fashion has always been an important part of Suzanne's life. As a child growing up in Greensboro, Suzanne's mother realized the only way to punish her occasionally naughty daughter was to take her Barbie dolls away. 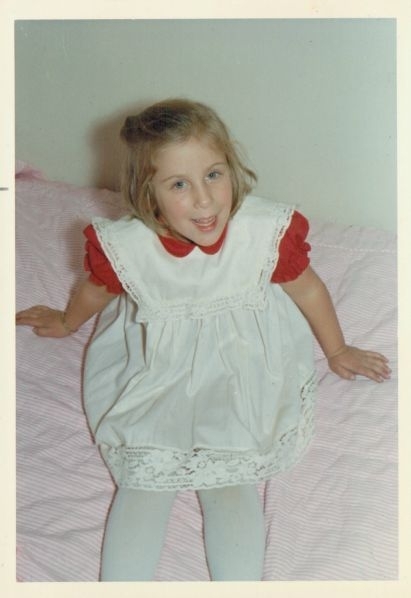 Suzanne laughs when she recalls how she would dramatically throw herself on the bed and wail, "No, Mommy! Barbies are my life!" A love of clothes and fashion has always been a part of Suzanne's life. Suzanne was a marketing major at Philadelphia University with a minor in retail when she met her future husband, Sid, on a college youth group trip to Israel. He was a student at the University of Medicine and Dentistry of New Jersey when they were assigned seats next to each other on the long flight. "We played cards and had hours to get to know each other," she says. "We made a bet that whoever lost at cards would carry the other's luggage throughout the trip. I lost but he did not hold me to the bet. If I had been dragging his luggage around Israel that would have been the end of our relationship right there!" After marrying, she convinced Sid to move South to start their family and he opened a dental practice in Knightdale near Raleigh. Now their son Scott is 30 and a lawyer in Denver, Colorado. Their daughter Kelsi, 26, is a clinical therapist in Pittsburgh who works with children with severe OCD. Suzanne's own career began out of college when she worked for Macy's corporate office in the executive training program. From there, she worked for a small family business teaching managers and new hires how to create store visuals, layouts and design to increase sales. She was a freelance consultant in that field until 25 years ago when a friend who had recently returned from the West Coast told her about a growing new profession that she thought Suzanne would be perfect for: personal shopper and stylist. Suzanne worked at it part-time before getting her big break when one of her clients, North Carolina singer Rhiannon Giddens, asked Suzanne to dress her when she was nominated for, and won, a Grammy Award. Suzanne began working with more recording artists - from rock bands to gospel singers - and also began picking up a strong roster of non-celebrity clients. Then she wrote a book, Portraits of Lifestyle Dressing: Your Style, Your Closet. It was during a book signing at SouthPark mall that she introduced herself to mall management. The mall's parent company is Simon, which owns around 30 malls across the U.S. Several months later, she was hired to become SouthPark's personal shopper. "Only five of Simon's malls across the country have personal shoppers, so it's an incredible job to have," Suzanne says. "They are so receptive to my ideas and supportive of me, But if I didn't have my husband's love, support and blessing I could not accomplish all that I do." Suzanne has fun styling a model during a fashion shoot at SouthPark Mall. A few things that I like to update every season and use as wardrobe staples are a trend jean, a white tee, and a graphic tee that shares how I’m feeling. Also, a cool cropped jacket either in a weathered leather or that's textured or colored. I’m very eclectic with my own personal style and it often depends on who my audience is. I can dress more classically with a twist if needed, but I also love a bit of edge without feeling out of place. What are some of your favorite pieces in your wardrobe? I have lots of favorites including a few graphic tees that speak to who I am and a combat style pant by Johnny Was that my daughter likes to make fun of. What are your favorite fashion labels? I tend to be all over the board, and really enjoy seeking out unknown designers that have created either garments or accessories that are unique. Do you have a uniform? I like trying new looks too much to have a uniform! Anything you've worn and regretted? A dress I bought in Italy that I loved when I bought it, but somehow felt like a "hoochie mama" the one time I wore it. What's your most treasured article of clothing? A thigh length, side tie, vintage taupe colored winter coat trimmed in fox around the collar and hemline that my 4’11” mother-in-law gave me. Although it looks totally different on me with my height, it’s still very special. What's your most treasured accessory? A necklace my daughter bought me from a jeweler at a street fair in Italy. She took a lot of effort in deciding which one I would like best. It’s pretty cool and a true conversation piece. I love to noodle around in boutiques and vintage stores when I am traveling. That’s when I find the best items. My daughter turned me on to Anastasia brow pencils and now I am a junkie! Thanks to my grandmother Mildred (whom I loved dearly) I inherited limited eyebrows. I went from a child with blond brows to an adult that looks like I have only a forehead and eyes unless I do the pencil thing to color them in. Fortunately, that little gene was not passed along to my daughter! What's one of the best beauty tips you've learned? Good skin care makes all the difference in the aging process. What's your favorite restaurant for lunch? I am a Reid’s salad junkie when I am at SouthPark. And I love checking out the cheese section on the way out and getting some to go. My grandmother had a tulip garden where she lived in Connecticut. She always had vases of tulips scattered throughout the house. I especially love the tulips that are variegated. I generally grab a small bunch from Whole Foods when the price is right. Any museum exhibits or performances you've either seen recently, or plan to see soon? Call me crazy but most people are surprised when I tell them how much I love country music. My husband and I saw Blake Shelton in March in Greensboro. I wore a really cool dress from Johnny Was that I rocked with my cowboy boots. Bless the people around me, because my voice is not one of my best attributes. Most recently it has been Ladybird, but I still revert back to Robert Redford and Barbara Streisand in The Way We Were. All I ever wanted was one evening with Hubbell Gardiner! One of my favorites as a young teen that I still love today is A Tree Grows In Brooklyn by Betty Smith. I have two wonderful rescue dogs - Addie and Bridgett. I call Bridgett trouble on a stick, as she is always busy and into something. Addie is my old dog reincarnated and extremely sweet and laid back. They are the best and always happy to see me. What's the biggest mistake people make when hosting a party? It took me years to feel comfortable doing this, but if someone offers to bring something, take them up on it! My house is like I am, eclectic. I love combining traditional with contemporary and Art Deco. I am all about less is more and went on a rampage a few years ago to get rid of the clutter. What would you like to bring back in style? I feel like everything comes back in style in one way or another, but I want a bike with a floral banana seat, like I had as a kid, to go cruising around my neighborhood. Right now I am training for a standard Triathlon in Williamsburg, Virginia this summer and it’s been a challenge. I am the fittest I have been in a while, which feels good, but I know myself....there will be another sports challenge on the horizon! My husband Sid, my kids Scott and Kelsi, and my new daughter-in-law Alisa bring me an immense amount of joy. Add a handful of supportive, loving friends and my work which I absolutely adore, I feel very blessed and experience joy daily! I often pinch myself. What do you love about this stage of your life? Being over 50 has definite advantages, I have so much life experience at this point that I feel as though I am able to keep things in a healthier perspective. I am more forgiving to myself and appreciate the little things that either come my way or that I am able to offer others. I give myself permission to be myself with others. For years I wouldn’t go out without hair and make up. Now, what you see is exactly what you get and it feels right. What are your favorite charitable causes? I appreciate what Dress For Success stands for. The whole organization does such a great job empowering woman. I cherish the opportunity I have to work with them in both Charlotte and Raleigh, either styling for a fashion event or dressing mannequins for the boutiques. I love the time I spend with them and call it therapy for the soul. The people that I encounter daily. Everyone has a story and I always find it inspiring in one way or another. What would others be surprised to know about you? That I silently really wanted to be a standup comedian, but my family doesn’t think I’m a funny as I think I am! What's in your glass during Happy Hour? Whatever is being poured but generally a cabernet in the winter, a white wine in the spring, and a Moscow Mule in the summer. Live your life and do what makes you most happy while sharing your life with others that have the same sentiment. What's your favorite healthy snack? I love sea salt almonds and almond butter on an apple. What's the best business advice you've ever received? Don’t give away your talent for free unless it’s for charity. You are worth so much more! People that know me sense my passion for what I do and the importance of what I share with clients about feeling good about themselves. It’s about getting up in the morning and getting dressed in an outfit that allows them to put their best foot forward for the day. It’s with this passion and a strong sense of determination, drive, and family support that I have succeeded. Francene Marie Morris is an award-winning radio host and media personality. When you talk to radio personality Francene Marie Morris about her childhood, it's clear she was destined to be on-air. "I was born in Chicago but raised in Missouri by my single mom," Francene says. "On Friday nights my grandfather would either make or bring home an amazing meal. After we ate, everyone would go into their respective corners. My mother would go and play the piano. I would take my mother's tape recorder and lock myself in her bedroom and record my voice and pretend I was on the radio." Francene as a young girl growing up in Missouri. That early practice paid off. As an award-winning radio host for Beasley Media Group, Francene can be heard on a multitude of stations including Smoke 94.7, KISS 95.1, Power98, WPEG-FM and V101.9. She's also a popular advertising spokesperson and emcee for major galas and events. And she teaches the next generation of talent at Carolina School of Broadcasting. It's ironic she's teaching young people the business because she didn't enter the industry until later in life. "When i was 18, I got pregnant. It's said that when you have a child, you lose 18 years of your life and it's true. I got off track." Francene in a fragrance ad with famous boxer Muhammad Ali. She did have a career as a professional model, including a fragrance ad campaign with Muhammad Ali, and did image consulting and public speaking. But it wasn't until her late 30s that she began to pursue her childhood dream of being on the radio. Francene was a professional model before pursuing her radio dreams. To get her fashionable foot in the door, she took a part-time job as a receptionist for CBS-owned radio station KISS 95.1 and began honing her voice. Bill Schoening, a manager at the station who's still a radio executive with Beasley, believed in Francene and allowed her to go on-air as public affairs director. "This was around 1996 and back then talk radio was not popular. It was something stations had to do to meet their FCC requirements." During the day, Francene would work as a receptionist and assistant. At night she would record the public affairs show. From there she advanced to sales while also growing a following as a radio personality. "I've made every mistake a girl could make," Francene says. "It has been a journey. Luckily I can laugh at myself. But I never gave up. I didn't let anything stop me." 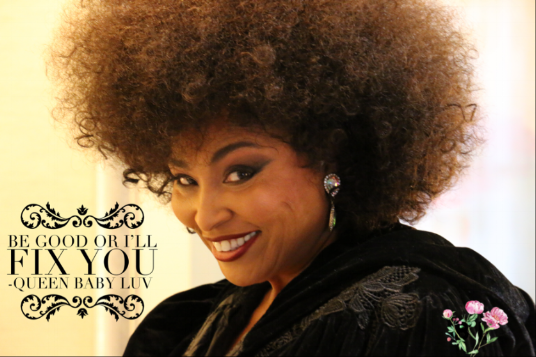 Watch out for Queen Baby Luv, a new character created by Francene. Be good or she'll fix you! Her newest project is more visual: Creating short videos of a character she created named Queen Baby Luv whose tagline is "Be good or I'll fix you." Francene describes Queen Baby Luv as an outrageous take on the Foxy Brown character from the 1970s, but with an alien/superhero spin. "Queen Baby Luv is funny and loving and not from this world, but she's here to help us with everything from beauty tips and relationship advice to solving serious personal and social issues." The two loves of Francene's life are her two children: son Damon, 41, an artist-at-heart like his mom who works for a mortgage lending company in New Jersey; and daughter Desi, 24, an engineer in Richmond. "I just really like them as people," Francene says. As for The O Report, we loved Francene's answers to our questions, especially her advice on what every room needs; her shoe philosophy; and what people would be most surprised to know about her. The beach and mountains. They both feed me in so many different ways. What's your favorite hotel in the world? I love staying at quaint boutique hotels in Savannah when I need to escape and unwind. That perfect black dress, slacks, and blouse you can wear twice a week and no one ever notices because of the different accessories you add. Taking classic looks and turning them into something avant-garde. My gigantic gypsy pants. I could wear them every day. Donna Karan, Karen Kane, Michael Kors and the amazing St. John. Who's your biggest style influence? There are so many, but fashion icon Iris Apfel is my go-to. Nope, but if bellbottoms count you can catch me in them at least twice a week. Oh yes! I’ll put something together for a black tie event and regret it as soon as I see the pictures. What is your must treasured article of clothing? A black vintage jacket with multi-layered sleeves. What is your most treasured accessory? A clip-on pair of giant chunky gold hoop earrings. I’ve fallen in love with e.l.f. products, but my go-to has always been MAC. How do you protect your skin from the sun? I don't do that as much as I should. I do try to take care of my skin by using a mix of coconut oil with good quality essential oils. What are some of the best beauty tips you've learned? Taking my makeup off at night with coconut oil followed by witch hazel. Was there any beauty or style advice your mother or grandmother gave you that you're thankful for now? Buy great quality shoes! They'll last forever. I'm a fan of wedges. They're comfortable, classic and stylish. What's your favorite restaurant for a big night out? BAKU. They have the best marinated pork belly you’ll ever taste! What is your favorite brunch spot? Any decent hotel serving a nice spread. My next adventure will be the Marriot in the deep of south Charlotte. What is your favorite restaurant for lunch? Grabbing a Beet Juice and a Caesar Salad from Living Kitchen. My guilty pleasure is Pad Thai from Rai Lay on South Boulevard. A cool Succulent Frame from Crafts At Hand, my daughter's online craft store on Etsy. She puts together DIY craft kits for everyone from beginner to advanced crafters. Lilac, lavender, lilies and a good grade of roses. Any museum exhibits or arts performances you've either seen recently, or plan to see soon? I’ve got to get to the National Museum of African American History and Culture the next time I’m in Washington, D.C. In Charlotte, my favorite museums are the Harvey B Gantt Center for African-American Art + Culture and the Bechtler Museum of Modern Art. Little Shop of Horrors, Michael Clayton with George Clooney, Out of Time with Denzel Washington and Spike Lee’s new version of She’s Gotta Have It. Louise Hay's You Can Heal Your Life. any book by Chelsea Handler especially Lies that Chelsea Handler Told Me, and Move Your Stuff Change Your Life by Karen Rauch Carter. My newest favorite read is Blackness – The Life and Times of an Unpopular People. What is your most treasured home decor item? Five-foot tall giant Giraffe palm leaves, my chaise lounge and handmade dreamcatchers. Making guests wait for the food! What's your favorite host/hostess gift to bring to a party? Wine, tea towels, sweets and homemade greeting cards. Gaudy and colorful, but my bedroom is themed as a healing room. Styles from the 1970s are creeping back, but I wish we could go all the way. What does every room need? A diffuser pumping out lavender, plants that have healing properties and soft comfy pillows. I have perfected my own signature water aerobic routine before jumping in the steam room laced with eucalyptus. My kids surely do now that they’re adults. I sit back and see the fruits of my labor at work. I’m a very proud mom of Damon and Desi. I used to hide from my true age since I’m in media. In fact on all social media sites I fib big time. But in August I'll have a huge milestone 60th birthday. I have never felt freer! Any quaint boutique, consignment shops and my all-time favorite - Goodwill scavenger hunts. Do you have a great organizational or timesaving tips that save your sanity and help make your life run more smoothly? To get a jump on the stress I try to keep the kitchen clean and that underwear drawer neat. For some reason if it’s in disarray so is my life. If things are neat so am I. What was one of the defining moments in your life? Twenty-two years ago when Bill Schoening, who was the the Vice President and Marketing Manager manager for CBS then, said that I could start hosting and producing my own talk show. I’ve fallen in love with a few: B.R.A.K.E.S., Brave Step, and Charlotte Concerts. Who's your favorite famous person you've met? Seal, the amazing singer and songwriter. Back in 2003 we invited him to sing in a small venue. I absolutely had eye to eye contact during his set, which led me to believe he would be my future husband. After the show I went backstage and we hugged and something blurted out of my mouth that shocked me! I asked him to sign the girls! How embarrassing! Being the good-hearted man he is, he just laughed and hugged me. Our morning show at the time made that the laugh of the week! My kids for sure – they’re full of surprises and advice for me. My local fashion sensei is Terri Joelle, she helps me put together cool wardrobe mixes. And the female sales crew at Beasley Media Group. I love quiet time more than anything! Sitting on the beach alone, going to the movies alone, eating at cool restaurants alone. I’m literally a party-of-one kind of gal. Do you have a motto or words that you live by? Yes! Think and do life. Create an atmosphere you desire to live and work in. People Photo credit: Portrait of Elizabeth “Beegle” Duquette from the book “More is More: Tony Duquette."